KUALA LUMPUR: An influx of office space in the Klang Valley is putting a downward pressure on yields. Property consultants said the entry of more office space was making the oversupply situation worse. However, they said the situation could be remedied should the economy perform better, thus keeping demand afloat. “In certain areas, yields will be pressured downward because of the glut situation. But this is also highly dependent on the location of the offices. Those located in prime areas will have less chance of coming under yield pressure,” DTZ Debenham Tie Lung executive director Brian Koh told StarBiz. Khong & Jaafar managing director Elvin Fernandez said that the slightly higher vacancies this time around was “not too abnormal a situation”. “However, there could be a lot more supply that would flood the office space sector in the medium to long term,” he said. There were 20 million sq ft of vacant space in the Klang Valley, 22.5 million sq ft of office space under construction and 25 million sq ft which had been approved for construction. The Government recently earmarked several areas for commercial development such as the KL International Financial District in Jalan Tun Razak, the 100-storey Warisan Merdeka, the Sungai Besi military airport and the Rubber Research Institute land in Sungai Buloh which are expected to come onstream within the next 10 years. 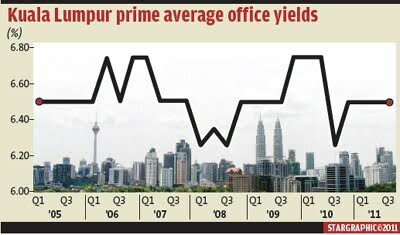 Meanwhile, a report by CB Richard Ellis released earlier this month revealed that office yields in Kuala Lumpur prime area had been flat from 2005 until 2011, ranging from a low of 6.25% to a high of 6.75% (see chart). The report also showed the office space vacancy rate in the Klang Valley was under 13% on an average basis, which consultants said could rise once new space came in with the completion of several mega projects. “With all the large-scale development projects coming in, we are looking at a potential oversupply situation but if the economy does exceptionally well despite the problems in the eurozone, this problem would ebb,” said Koh. Vacancies had risen during the 2008 global financial crisis in prime office spaces and rental rates had been on a slight decline. The prevalent trend among corporates was to move their bases away from the city centre into newer office buildings within other established suburbs such as Petaling Jaya and Klang as many of the workers lived in these suburbs. “After the My Rail Transit has been completed, office development would focus back to the city centre as long as they are affordable and corporates can make a decent profit even after paying off these leases. I expect this trend to reverse and that Kuala Lumpur will remain at the primacy of development in the Klang Valley,” Fernandez said. 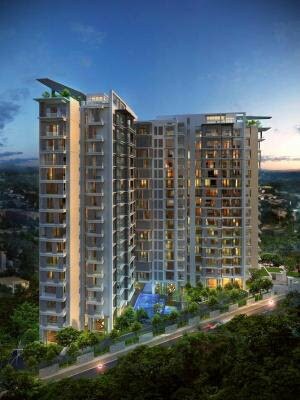 Lush greenery: An artist’s impression of Amphil’s Rimbun condominium. PETALING JAYA: P. K. Poh, the chief executive officer and director of relatively new boutique developer Amphil Corp Sdn Bhd, is a perfectionist. The company will start selling its maiden project Rimbun, a “green” high-end condominium project, next month. However, Poh is still unsatisfied with the number of green features being offered as he feels there should be more. To be located in Jalan Ampang Hilir, behind the Great Eastern Mall in Kuala Lumpur, there will only be 56 units with prices ranging from RM1,000 to RM1,200 per sq ft. With a gross domestic value of RM200mil, the 17-floor Rimbun comprises 28 units with a built-up area of 3,500 sq ft and 26 units with a built-up area of 4,500 sq ft. There will also be two triplex penthouses with built-up space of 18,000 sq ft. Poh said Amphil would retain one of the penthouses. Poh said Rimbun was targeted at individuals in their mid-forties and onwards. “These are the people who have travelled the world, stayed in the best hotels, are currently living in large, luxurious houses and whose children have flown the coop, locally or overseas. “They may now prefer to move from houses to a more secure condominium unit that is at least 3,500 sq ft, with high-tech smart home systems and broadband connectivity. Anything smaller in size will not be comfortable for them as they are used to a spacious environment,” he said. Poh said he was optimistic of the potential take-up for Rimbun. “Of course, we don't expect it to be totally sold out in a week. But we don't want it to be that way as well. We want people to understand and appreciate what we're offering. “Rimbun is just minutes away from all the excitement in the KLCC vicinity with all the dining, shopping, entertainment and commercial outlets. Yet, it does not have the noise and cramped conditions of city living. “Our access is via tree-lined avenues and we are surrounded by a polo club, a golf club, parks, lakes, top medical centres, a number of international schools and so on. We call it the best of both worlds,” he said. The name Rimbun, which means “lush, leafy greenery,” is matched by a plethora green features that will be incorporated into the building. The environment-friendly features include solar photovoltaic panels, rain water harvesting system, aerated concrete blocks, high internal ceilings, high performance glass, low volatile organic compounds paint, green label fittings, energy-efficient lighting, titanium dioxide coating, motion sensors, energy-efficient lifts, recycling bins, non-chemical swimming pool, herb garden, drip irrigation with rain sensor, naturally ventilated porch and terrace, recycled rubber humps, hybrid vehicles car park and fume extract sensors. There will be more features but right now, Poh prefers to keep them under wraps for competitive reasons. Rimbun has also achieved the internationally recognised green-mark gold plus provisional certification from the Building and Construction Authority, Singapore. One of the biggest challenges leading up to full construction of the building was for Amphil to ensure that it complied with the dictates of Conquas, which is Singapore's construction quality assessment body, said Poh. The project is slated for completion in the third quarter of 2014. Poh said that the company did not decide to go green in a big way just because it felt like the “in” thing to do. “With all the environmental degradation and global warming that are going on, we felt that we needed to build something sustainable. “It is said that buildings contribute 40% to the total carbon emissions, which makes developing a truly green building a heavy responsibility and it behooves us to ensure that our carbon footprint is reduced as much as possible,” he said. Poh said it was uncommon for a typical condominium project in Malaysia to have so many green features incorporated into its structure. “This makes Rimbun stand out from the rest. “A developer may incorporate a number of green features over a range of projects but never so many into just one. Amphil was set up in 2007 and spearheaded by Poh, who has 30-odd years of experience in the property market. He is also a director and adviser for Tradewinds Corp Bhd. Poh said Amphil comprised “a very small team of people” that was supported by a strong group of consultants and engineers with years of experience. The company is solely focusing on Rimbun but is open to potential joint ventures for future projects. KUALA LUMPUR: For a while now, there has been speculation about who would partner Ivory Properties Bhd in its multi-billion ringgit Bayan Mutiara project in Penang. That was ended when it roped in Dijaya Corp Bhd. They now plan to build residential and commercial properties on the land, estimated to generate sales of some RM10 billion. This is not their first tie-up. Within the Batu Ferringi tourism belt, Dijaya has a joint-venture project called "10 Island Resort" with Ivory. In Bukit Mertajam, Dijaya has a mixed development project dubbed Aston Villa, in which Ivory is the turnkey developer. But that partnership has overshadowed an interesting fact. Penang has now seen the entry of two highly successful businessmen and both happen to be brothers. Dijaya is controlled by Tan Sri Danny Tan Chee Sing, the younger brother of Berjaya Corp Bhd founder and chairman Tan Sri Vincent Tan Chee Yioun. Barely three months ago, the senior Tan made a comeback to Penang as a property developer after a hiatus of nearly two decades. The Berjaya Group - via Berjaya Land Development Sdn Bhd - signed a deal to buy 22.8ha of prime freehold land within the Penang Turf Club for RM459 million. At the signing ceremony in Penang, Vincent did not mince his words in expressing his displeasure with the previous state government. Vincent's approval of the current state administration is a strong signal to other developers that the island state has plenty of potential. And this probably explains Danny's continued interest. The latest alliance with Ivory is a very big undertaking and one which will ensure its presence in the state for many years to come. Danny, the man behind Petaling Jaya's Tropicana Golf and Country Resort, will have his hands full with the latest venture. As for Vincent, he did not discount the possibility of enlarging Berjaya Group's footprint in Penang. Together, the Tan brothers will be a force to be reckoned with in Penang. 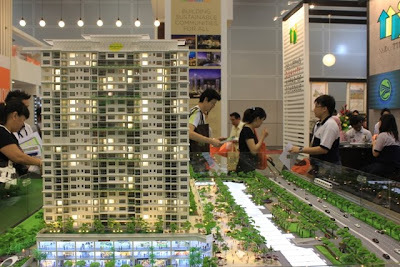 Ongoing project: Lim looking at a model of the D’Island Residence project in Puchong which has a GDV of RM3.5bil. PETALING JAYA: LBS Bina Group Bhd is looking at a few avenues to raise funds to finance new land acquisitions for its projects. Managing director Lim Hock San said the options included internal funds, bank financing and private placement. “We are still in the assessment process and nothing has been firmed up yet. An announcement will be made if a plan has been finalised,” he told StarBiz. According to Lim, LBS is currently studying a few proposals on possible land acquisitions to expand its landbank. LBS currently has a land-bank of about 2,300 acres worth an estimated gross development value (GDV) of RM9.1bil. Some 46% of its land-bank, or 1,071 acres, is in Selangor, while those in Johor make up 25% of its land-bank (574 acres), Perak 18% (406 acres), and Pahang 3% (70 acres). It also has 197 acres in China. Its ongoing projects include D'Island Residence on 175 acres in Puchong comprising 237 super-link houses, 298 semi-detached units, 148 bungalows and 352 condominiums. The project with a GDVof RM3.5bil will also have two blocks of commercial units. Its other flagship development is Bandar Saujana Putra that spans over 835 acres in Selangor. The township launched in February 2003 has a GDV of RM3bil. LBS also has projects in Cameron Highlands and Bandar Putera Indah in Batu Pahat, Johor. In Cameron Highlands, LBS is the developer with the largest market share and the company intends to add land-bank there to cement its leadership position. According to Lim, D'Island Residence will be the biggest growth driver contributing to 41% of its project GDV for the current financial year ending Dec 31, while contribution from Bandar Saujana Putra is expected to make up 36%. LBS is targeting sales of RM650mil this year and RM800mil in 2012. As of Nov 20, it had recorded sales of RM604mil. It also had unbilled sales of RM639mil as of Nov 15. Lim said for the year to-date, the company had launched 1,295 property units worth a GDV of some RM630mil. Next year, there will be 17 project launches comprising 2,085 units with a GDV of RM1.4bil. 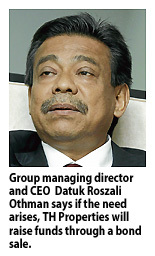 The sales target for FY12 is RM800mil. OSK Research said in a recent report that LBS Bina should be able to record decent revenue growth over the next few years since it had moved into the mid to high-end market segments from the low to medium-end segments. The growth in revenue was underpinned by strong unbilled sales and take-up rate for its recent launches. “To achieve its sales target, LBS plans to launch more than RM1bil worth of projects for this year, with its flagship Bandar Saujana Putra to account for about 45% of the value of the launches,” the report added. The research house said the company's decision to move up the value chain in the residential market and re-position itself to focus on medium to high-end projects had enabled it to record over 70% year-on-year growth and make a return to the black with profit after tax and minority interests of RM16.5mil in FY10. It said the unique concept incorporated in the D'Island project contributed to the strong take-up rate, and the project should provide a strong foundation for LBS to further strengthen its position in the high-end market segment. As for the Cameron Highlands and Batu Pahat projects, although the market size in those areas was rather limited, having a presence there should be able to provide the right balance for LBS through geographical and demographic diversification. KUALA LUMPUR: TH Properties Sdn Bhd expects more foreign biotechnology companies seeking expansion to set up shop at techpark@enstek in Sepang, Selangor. techpark@enstek is the biotech hub at Bandar Enstek, TH Properties's ongoing 2,046ha integrated township development in Sepang. So far, Phase 1 of techpark@enstek has attracted 21 companies with a combined investments exceeding RM1 billion. TH Properties group managing director and chief executive officer Datuk Roszali Othman said the company expects to ink agreements with three more companies by early next year. "They are serious in expanding their operations and are targeting our biotech hub because of the facilities we provide and its close proximity to the airport," he told Business Times in an interview recently. Roszali said that there are more enquiries now from local and foreign parties on available land at techpark@enstek. "We have 30ha remaining under Phase 1 and this will be fully taken up when the three companies come in. We expect to launch Phase 2, which will have 160ha of land valued at around RM400 million, a year from now," he said. Bandar Enstek is located nearby the Sepang F1 Circuit and the Kuala Lumpur International Airport. The township comprises four main components, namely residential, a commercial hub, institutional zones and techpark@enstek. Since its inception in 1999, the township has attracted investments of more than RM2 billion from government bodies and the corporate sector. "We are planning more recreational facilities at the whole of Bandar Enstek. We want to get more profits. As the township matures, we want to rake in high margins," he said. TH Properties is targeting private finance initiative projects under the Economic Transformation Programme. TH Properties Sdn Bhd, the property arm of pilgrims fund management institution Lembaga Tabung Haji, will take on more infrastructure projects in Malaysia to expand the company. Group managing director and chief executive officer Datuk Roszali Othman said the company has about RM1 billion worth of construction jobs in hand and this is expected to increase next year. It expects to conclude several deals with the respective government agencies by early next year. "We are looking into the bigger role now, especially to drive up our construction activities. We have very low gearing and substantial cash in TH Properties to move up a notch," he told Business Times in an interview recently. Roszali said if the need arises, TH Properties will raise funds through a bond sale, among others. TH Properties is involved in property development, construction and facilities management. Its ongoing construction contracts include a RM400 million job to develop a complex in Putrajaya for the Department of Islamic Development Malaysia. TH Properties is also involved in Tabung Haji's integrated Haj Pilgrims Complex development at the Kuala Lumpur International Airport, besides carrying out its own two property development projects in the Klang Valley. The two projects are the RM9.2 billion Bandar Enstek township in Sepang and a residential project in Keramat, worth RM700 million. TH Properties will launch several new phases at Bandar Enstek and the project in Keramat next year. "What we intend to do is to grow all our businesses. It is a positive move forward," Roszali said. Said NTV7 news anchor Sheahnee Iman Lee, “This is my first time attending the Star Property Fair. There are a variety of projects showcased by top developers." Currently staying in a condominium in Shah Alam, Lee is looking for landed property with a built-up area of 325sq m (3,500sq ft) within the Klang Valley. “I’m keeping my options open and hope to find a house that is spacious and convenient for me and my husband to travel to and from work," said Lee, who is expecting her second child. Penangite Chin Yoon Ming, 29, was looking to buy a high-rise property near the Second-Link in Penang. “I’m looking for a three-bedroom condominium. My budget is around RM500,000." This was Chin’s first time at the fair and he hoped that there will be more mid-range properties showcased in the next property fair. Electrical engineer Laurence Xin from China has been staying in Malaysia for one-and-a-half years and was looking for a condominium unit within Mont' Kiara. “My main priority is security. I want a place with good security,” said Xin. He was shopping for a condominium unit that was at least 279sq m (3,000sq ft) with a minimum of three bedrooms. 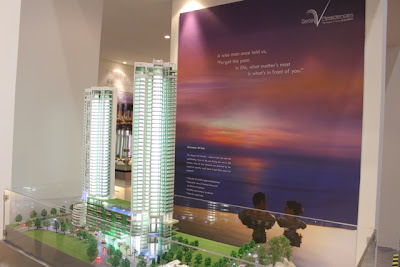 Touted as one of the first luxurious condominium developments in the Klang Valley overlooking a golf course, the Tropicana Grande project was one of the developments promoted at the Dijaya Corporation Bhd booth. Located in Persiaran Tropicana, the Tropicana Grande development boasts a total of four blocks with only two units per floor – ensuring privacy and exclusivity. With a total of 328 units, the most popular layout choices among the buyers were the "smaller" units, ranging from 212sq m (2,283sq ft) to 254sq m (2,733sq ft). Prices range from RM1.4mil to RM1.9mil. For buyers with larger families, they can opt for the more spacious units that offer a built-up space from 308sq m (3,311sq ft) to 341sq m (3,666sq ft). Prices for these units start from RM2.4mil. 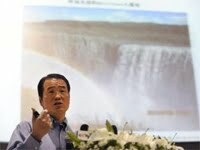 BEIJING: A multi-millionaire Chinese developer is livid at Iceland’s rejection of his plan to build a sprawling resort, saying it reveals Western “hypocrisy and deep prejudice”. Foreigners also wrongly assumed Chinese companies automatically had ties to China’s military, Huang Nubo said in comments published in Chinese media yesterday. The Iceland government on Friday rejected a bid by Huang to buy 300 sq km on the island nation because it did not meet legal requirements on foreign ownership. Some commentators have said the plan raised questions over regional security because of Iceland’s strategic location in the Arctic where a number of nations are competing for resources, suggesting that Huang could be a surrogate for Chinese expansionism. “I’m not buying land, I’m investing in tourism infrastructure,” Huang said in an interview with Sina Finance, an online news service. “The difficulties that Chinese enterprises encounter are numerous, like the view that state-owned enterprises represent your country, that whatever your background is you’re a military business and touch on national security,” he said. “You can come and buy a house, and you can emigrate here and bring your riches with you, or you can buy my luxury goods, but if you want to touch my natural resources, then I’m sorry, I won’t let you,” he said. Huang, who is chairman of Beijing-based Zhongkun Investment Group and was 161st on the Forbes list of the richest Chinese in 2010, accused Westerners of double standards. “They come to China and say, ‘this isn’t open, that isn’t open’, which just shows their hypocrisy and deep prejudice and unjust nature,” he said. Huang had agreed to pay one billion Iceland krona (US$8.3mil) to buy Grimsstadir farm in northeast Iceland, where he planned to build a golf course, hotel and outdoor recreation area. But Iceland’s Interior Ministry said on Friday that the deal did not meet legal requirements for land sales to companies outside the European Economic Area, including that company directors must be Icelandic citizens or permanent residents for at least five years, and that 80% of shares in purchasing firms should be held by Icelandic citizens. The deal would have marked the first major Chinese investment in Iceland, which is still recovering from the collapse of its banks in 2008 during the global financial crisis.